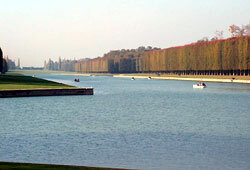 The Park of Versailles spreads over more than 800 hectares and it is completely fenced. Other than the palace itself, it encloses several famous sites that add to the renown of Versailles : the Orangerie, the Grand Canal, the French gardens, the fountains, and the Estate of Marie-Antoinette with the Petit Trianon and the Grand Trianon. 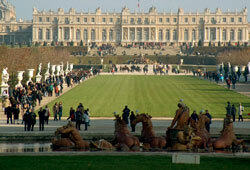 This huge park with its gardens, bosquets, caves and fountains should not be missed while visiting Versailles. It was set up from 1661 to 1700 by the master gardener Le Nôtre. 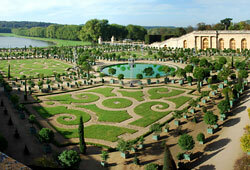 The Park of Versailles is considered as the model of French gardens. It is adorned with statues of marble, bronze, or lead, fountains in play and the myth of Apollo is a reference. 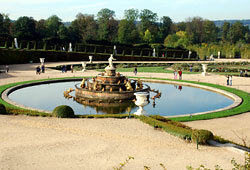 The Orangerie is located under the “Parterre du Midi” in the lower part of the palace. It consists of a 155 m long central gallery and two galeries on the sides located under the “escalier des Cent Marches”. The Orangerie is 13 m high, it gathers more than 1000 trees : orange trees, lemon trees, pomegranates (some of them being several centuries old), rose-bays… and it is enlighted by large windows. The trees do not produce many fruits, the gardeners of the palace of Versailles bring them out every year from mid-May to mid-October. The cross-shaped Grand Canal is 1.5 km long, 62 m wide and the total rim is 5.5 km. In its principal axis, it extends the perspective of the gardens to the infinity. With the line of beech trees, oak trees, ash trees and wild cherry trees it displays an harmonious overview. The Grand Canal was used during royal events as a starting point for fireworks or as a real theater set. During Louis XIV reign, it hosted a three-masted ship, a galley, rowboats, gondolas from Venice… From a practical point of view, the Grand Canal is located on a lower level than the palace, it collects water from the fountains and pump it back to its starting point. There are more than 30 fountains in the gardens of Versailles, the most famous are : the Neptune fountain, the Apollo fountain and the Latona fountain. During Les Grandes Eaux Musicales de Versailles the 50 fountains contribute to the great show of water-jets. The Neptune fountain presents 150 different water effects during this show!